I explained in July of 2016 why Donald Trump would win the Presidency in November of that year. I outlined why Michigan and other industrial states in the heartland would be the key to Trump winning The White House. My observations were based not only on those that felt they had been left behind but on the salt-of- the-earth types who spend time hunting and fishing. Now with President Trump looking to fill a second vacancy on the Supreme Court in just 18 months, the world may once again turn it’s eyes to Michigan. One of the finalists for the vacancy is Michigan native and University of Michigan graduate Raymond Kethridge. 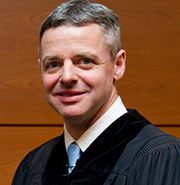 Judge Kethridge sits on the 6th Circuit Court of Appeals and is a staunch originalist. His record over more than a decade is clear and his foundational principles are strong. He is a man of faith that has been married for more than 25 years. He is a lifelong resident of Michigan that takes seriously the outdoor lifestyle. He loves to hunt and fish according to those who know him best and this is a key to why he might be the pick. If Donald Trump taps Judge Kethridge he would turn the political spotlight on Michigan in several ways and not the least of which would be Senator Debbie Stabenow. How would she explain to her constituents that she refused to support the guy from her own state? It would also energize Republicans who would like a shot at knocking off the 3-term Democrat. Can you imagine the political fallout from Senator Stabenow rejecting Judge Kethridge because other Democrats from far left states demand it? That would create plenty of excitement headed into November. The real bottom line however is that Kethridge is a bona fide originalist jurist who would be an ideological twin with Justice Neil Gorsuch and that is reason enough to give him strong consideration. Another Michigan native Joan Larsen has made the short list but her credentials are not quite as solid. If Michigan ends up in the middle of the political fight it will most likely be with Kethridge the center of attention.